Coastal and Marine Geography is a rapidly developing area of research within the Geosciences in Germany, generating new insights into highly dynamic environments that are constantly subject to change. This research field combines different theoretical and methodological approaches from various associated disciplines to explore the natural and societal dimensions of coasts and seas. In this special issue, we bring together these multidisciplinary research approaches applied from coast to coast. 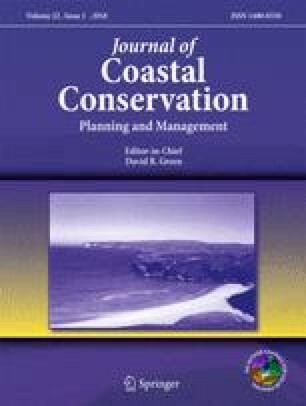 This special issue of the Journal of Coastal Conservation is based on the research of members of the “Working Group on Coastal and Marine Geography” (Arbeitskreis Geographie der Meere und Küsten, AMK). In 1983, the AMK was founded as a specialty group of the German Geographical Society. Since then, annual meetings have been held to present and discuss current trends of coastal and marine geography. The 33rd annual AMK conference took place in Hamburg, Germany, in May 2015 and the 34th conference was held in April 2016 in Rostock-Warnemünde, Germany. This issue contains key papers of the presentations given at these two meetings. They present highlights of coastal and marine research that (1) addresses the development and changes of the natural environment of the interface between land and sea, and (2) explores human-environment interaction, human perceptions, and governance structures that define and transform coastal and marine areas. The variety of contributions to this special issue resembles the diversity of subjects that were addressed at the aforementioned AMK meetings. One focus of the presentations at the 33rd annual meeting in Hamburg was the development of coastal zones in the Holocene, particularly addressing environmental dynamics and the influence of early human activities. With regard to human activities in the coastal zone, presentations assessed potentials and limitations of aquaculture and other use of marine resources, ecosystem services, as well as issues of coastal protection. These are crucial not only along the German coasts as the intensity of anthropogenic use of coastal zones is ever increasing. The 34th annual meeting in Warnemünde revisited these topics and expanded on key aspects. In particular, the role of humans in coastal development was the focus of the discussion. Current trends in coastal zone management were discussed as well as environmental risks (such as marine litter) that may adversely affect ecosystem services and the adaptive capacities of coastal zones in times of climate change. It has to be noted that despite the fact that the AMK is a German organization, its research is not geographically limited to German coasts and the adjacent seas. Members of AMK regularly conduct research along African coasts and the Mediterranean as well; thus these areas are represented in this special issue, too. The papers that comprise this special issue point to important research results on current environmental and societal dynamics and challenges in coastal zones. In their paper on contamination of coastal zones, Schernewski and others analyze the potential of macro-litter monitoring on a number of beaches along the Baltic Sea. They found that macro-litter monitoring methods are unlikely to be sufficient at the large scale in the Baltic Sea region because of the large number of beaches that are subject to regular cleaning. At these beaches, tourism is the predominant source of litter, creating a considerable amount of small-scale garbage, which leads to a substantial temporal and spatial variability of litter abundance. The methodology for monitoring can therefore only serve as a complementary method to assess the abundance of litter on many Baltic Sea beaches. Alternative methodologies to assess the amount of beach litter on beaches along the Baltic Sea are presented by Haseler and others. They show that locally applied techniques such as the rake-method or the frame-method provide simple and cost-effective means for meso- and macro-litter monitoring on beaches in the Baltic Sea region. Such monitoring, however, does not only yield data on litter quantity. Assessments of litter type can convey useful information that can be used for the identification of the origin of the litter. The current morphological setting of the German Baltic and North Sea coasts has been considerably shaped by sea level changes in the Holocene. Scheder and others reconstruct subtidal and terrestrial sediment depositions, focusing on particular facies (dwog horizons) and relating them to Holocene coastal changes in the Jade Weser region using a combination of archive and modern data. They find that this method is appropriate as an indicator for periods of stagnant regional relative sea level. The identified relative sea level changes were found to possibly originate from anthropogenic influence. These findings are in line with approximate absolute sediment ages that are derived in this study as well. The Wadden Sea ecosystems are vulnerable to accelerated sea level rise, which is expected to occur during the remainder of this century. In their paper, Hofstede and others apply a numerical model to assess the capability of Wadden Sea tidal basins to offset sea level rise. In particular, intertidal flats are found to remain resilient against sea level rise even for higher rates of sea level rise if the mean tidal range is sufficiently large. Implemented subtidal gullies might act as sediment sources for intertidal flats to further increase their adaptive capacity. However, the authors note that modeling results are strongly dependent on local conditions so assessments should always be conducted at small scale throughout the Wadden Sea. Biodiversity is another important research topic in onshore areas of coastal zones. Witte and others show that the distribution of different species of the sea grass Salicornia in salt marshes of the North Sea region depends on pedological conditions. Among the numerous pedological characteristics, redox potential and salinity of the ground are found to be the most important in determining Salicornia distribution. This shows that former distinctions of habitats that are solely based on physical aspects such as grainsize or the distance to the mean high tide line are insufficient and need to be expanded to include biogeochemical characteristics. While coastal protection is important in numerous coastal regions, it is only one means of anthropogenic coastal transformation amongst many. Quite often there are other anthropogenic uses that have a profound impact on coastal and marine ecosystems. To preserve marine biodiversity, Krost and others propose setting up wildlife corridors under water – a concept similar to those on land. Based on a case study in Northern Germany, they develop a general concept of how to implement such benthic wildlife corridors. The respective characteristics of these corridors depend on the given morphological setting and species composition, which are combined with data on anthropogenic use in a Geographic Information System (GIS). Depending on the success of implementation of benthic wildlife corridors in individual case studies, these corridors may become part of larger scale marine management schemes. Many studies have assessed the current state of the coastal and marine environment in Europe in detail. Socio-economic and environmental characteristics are now available in the European Atlas of the Seas. In their paper, Barale and others outline the contents of the latest version 4 of the Atlas that contains improvements to the Atlas’ infrastructure and composition. The web-based information system has been developed to serve as a publicly accessible web-based source of spatial data and aims to be used not only by scientists but also by the wider public and in policy making. The European Atlas considers various uses of marine areas, including fisheries. At least locally, marine aquaculture can have ecological effects on surrounding areas as well, supporting the often negative public image of aquaculture. In their paper, Ahrendt and others investigate public opinion on marine aquaculture in Kiel Fjord and introduce an integrated concept for the deployment of aquaculture in the fjord. Although marine aquaculture is competing with diverse uses throughout the bay, the widespread regional survey found less public reservation towards aquaculture businesses than initially expected. Nevertheless, the potential expansion of regional aquaculture business would have to address increasing impacts on the environment, which need to be spatially analyzed on the basis of an Integrated Multi-Trophic Aquaculture concept that is outlined in the paper. The state of the coastal environment is highly dynamic. Altered environmental conditions due to e.g. climate change not only affect ecosystems but also humans who call the German Wadden Sea region their home. The article by Döring and Ratter builds on recent interest in the social and cultural dimensions of climate change by investigating the regional framing of climate change. To explore perceptions and framings, a nationwide survey was conducted in conjunction with detailed interviews on three islands in the county of North Frisia, Schleswig-Holstein. Based on their findings, the authors identify six prevailing conceptual metaphors that are used to make sense of climate change at the regional level. Furthermore, they provide insights into place-based social and cultural conceptualizations of climate change. Accounting for perceptions and views of local stakeholders has also become a central aspect of current coastal management schemes. Multi-risk, multi-scale, and multi-stakeholder are terms that describe the increasing complexity of risk management processes. In their paper, Gerkensmeier and Ratter assess the contribution of a bow-tie analysis for risk management in the trilateral Wadden Sea Region. They demonstrate that the use of this methodology can facilitate collaborative identification, comprehension, and analysis of the management system. Thus, an adapted bow-tie analysis proves to be useful in providing an appropriate framework for enhancing the understanding of risk management processes. In their article on coastal realignment, Schernewski and others call for the application of comprehensive methodologies such as a Systems Approach Framework (SAF) to guide management responses to climate change induced coastal challenges in efficient ways. By retrospectively assessing the implementation process of a combined coastal realignment and lagoon restoration program project at a coastal area along the German Baltic Sea, they identify initial shortcomings in the consideration of prevailing conditions and the involvement of major actors. The authors show that these shortcomings caused great delays in the implementation of the project, which could have been prevented by the systematic application of a SAF. Due to the considerable diversity of coastal areas and the associated adaptive capacities to climate change, societal responses to environmental change usually have to occur at a local or regional level. In her paper, Süsser investigates how affinity to a given coastal region affects individual and collective engagement to address climate change. The empirical research conducted consists of qualitative interviews and a household survey in the municipality of Reußenköge (Schleswig-Holstein), and interviews with experts throughout the county of North Frisia and in Kiel. The article highlights the importance of memories, experiences, knowledge, and creativity for successful climate change adaptation and underscores the significance of policies that mobilize community-based action. Community-based responses to climate change impacts substantially differ between western African coasts and the North Sea. Evadzi and others assess the awareness of sea level rise in coastal areas of Ghana and look at protective measures taken in coastal communities to improve management strategies. Results from interviews with coastal inhabitants indicate that despite the fact that settlements particularly close to the shore are eventually subject to inundation, people aim at remaining in direct proximity to the sea, mainly for professional reasons such as fishing. The general level of understanding of sea level rise is moderate, with coastal protection measures in their view even being responsible for adverse side effects. These perceptions would have to be taken into account in the design of a comprehensive approach to alleviate the impacts of sea level rise in Ghana. In contrast, the long tradition of coastal protection in Northern Germany has given rise to an overarching strategy to address the consequences of sea level rise. Hofstede and Stock’s article outlines the current integrated policy strategy for climate change adaptation in the Schleswig-Holstein sector of the Wadden Sea. Even though active adaptation measures are not expected to be necessary within the next decades, actions to counteract adverse implications of accelerated sea level rise will become necessary sooner or later. In conjunction with the continued reliance on technical infrastructure for future risk management, priority is given to artificial sediment deposition in order to compensate for erosion; such deposits are expected to be environmentally sound and efficient. The papers in this special issue provide a comprehensive overview of both theoretical and methodological approaches and empirical results of the current multidisciplinary research in coastal and marine geography in Germany. It is a seamless continuation of the 32-year-long tradition to disseminate the results of the AMK annual meetings in special conference proceedings. Over time the emphasis of research in this working group has somewhat shifted from an environmental science perspective towards human-environment-interaction. The high diversity of topics covered in this special issue therefore emphasizes the truly interdisciplinary nature of current research on coastal zones. Two aspects of the presented papers should be highlighted: Firstly, coastal zones are constantly experiencing change and the resulting environmental and societal impacts pose continuous challenges for humans settling along coasts to address. Secondly, understanding environmental and societal dynamics and processes as well as human-environment interaction are prerequisites for a future-oriented, effective management of coastal and marine areas. The continued intensive use of coastal zones and oceans by humans and increasing environmental variability, which includes climate change, make further research necessary to secure the viability of coastal and marine environments and to increase the resilience of natural and social systems of coastal zones all around the world. Thus, coastal and marine geography in Germany can be expected to continue to engage in important and critical scientific debates in the coming years.